Cheesecake is one of my favourite things on this planet. As a child, I would ask for cheesecake for my birthday instead of cake. Learning how easy it is to make a keto cheesecake was so exciting for me. 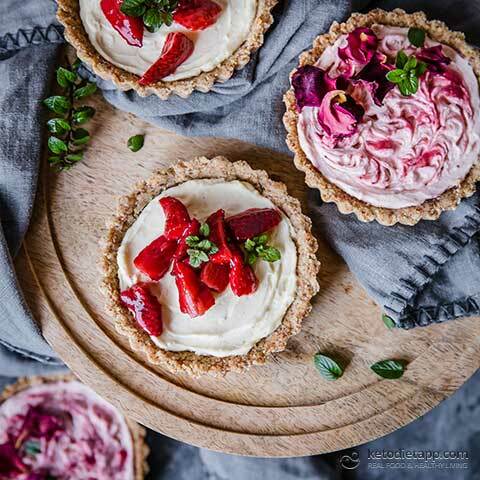 In this keto-friendly recipe, creamy, dreamy vanilla cheesecake is paired with deep, lush roasted strawberries. Unlike other fruits high in carbs, berries in general are ideal for a keto diet. 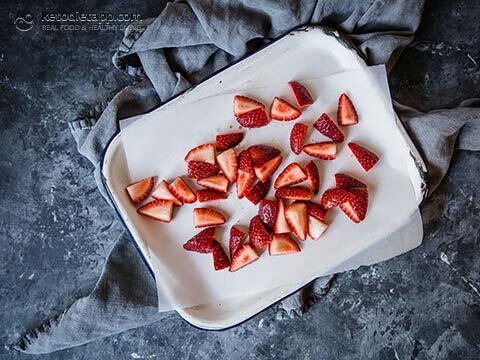 Never had roasted strawberries? You are in for a treat. Roasting the berries creates an incredible sweet and rich flavour. And it&apos;s not the first recipe with roasted strawberries. 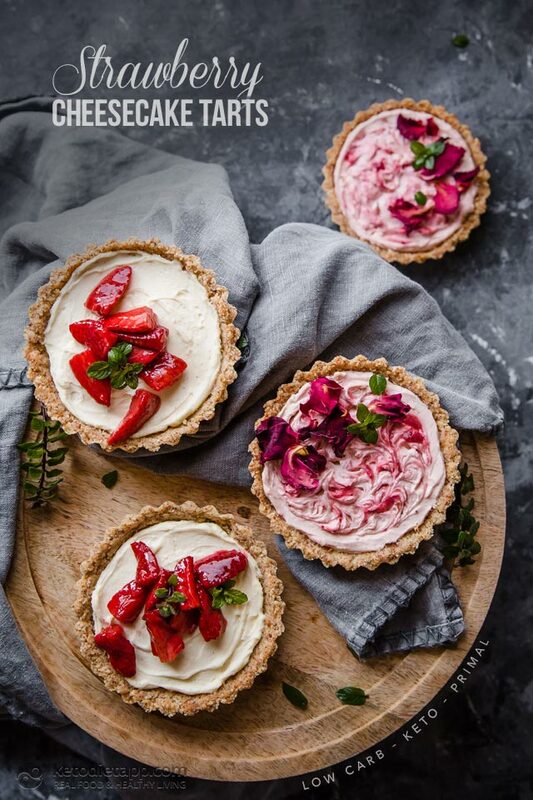 Make sure to check our Keto Strawberry Cheesecake Jars and Low-Carb Baked Strawberry Pots! I have made this keto dessert two ways; Vanilla with the roasted berries piled on top, and with the berries mixed through to create a strawberry cheesecake swirl. Make them whichever way suits you, they’re both divine. Enjoy! Note: If you can&apos;t tolerate cream and cream cheese or need a paleo-friendly option, use ghee in the crust and coconut cream as topping. Coconut cream is high in fat and just as delicious! Preheat oven to 175 °C/ 350 °F. Melt butter in the microwave. Place almond meal and sweetener in a bowl and add the melted butter. Mix until combined. 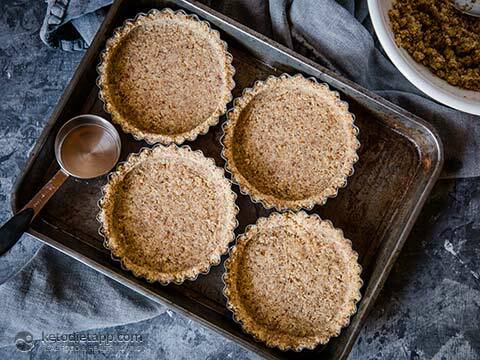 Grease individual tart pans - this recipe makes 6 mini tarts (12 cm /5 inch each), but I only have four. Or you can use one large tart pan. Using the back of a spoon, press the crust mixture firmly into the tart cases, using my measuring cup against the edge trick to get a great finish (as seen in my Keto Chocolate Coconut Custard Tarts). Prick base with a fork and bake for 15 minutes. Remove from oven, leaving oven turned on, and leave to cool for half an hour. 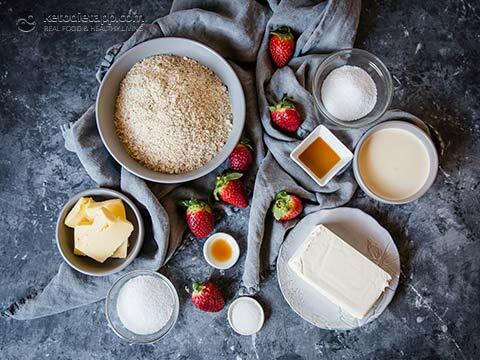 Quarter the strawberries and place in a bowl with the sweetener and vanilla, combining until berries are well coated. 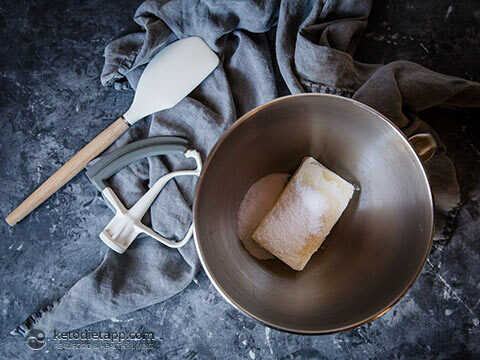 Tip out onto a lined baking tray and spread into a single layer. Bake for 15 to 20 minutes, until softened and juicy. Remove and sit aside to cool. 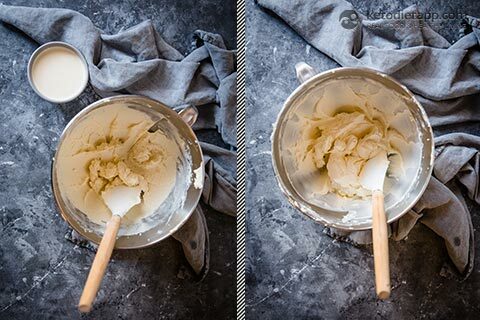 In your mixer bowl, place the cream cheese, sweetener and vanilla and beat until soft and fluffy. Add the cream and beat on high until smooth and creamy. 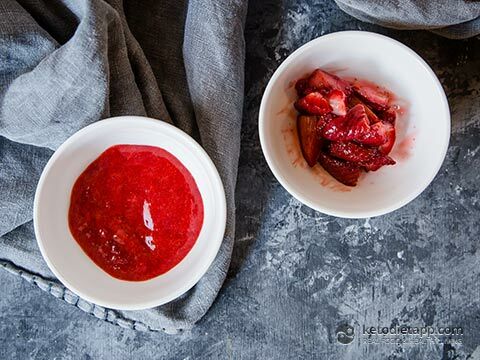 Divide your strawberries in half. Pass one half through a sieve until smooth and seed free. Mix this puree through one half of the cheesecake mixture, leaving a spoonful to swirl on top. 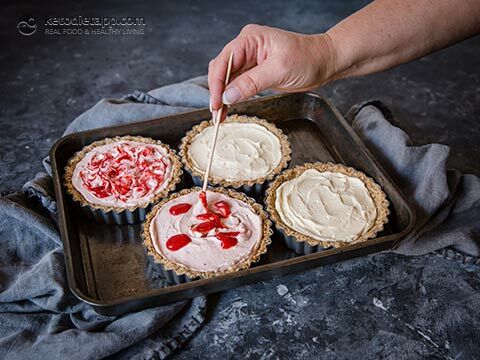 Spoon cheesecake filling into tart shells and smooth top. 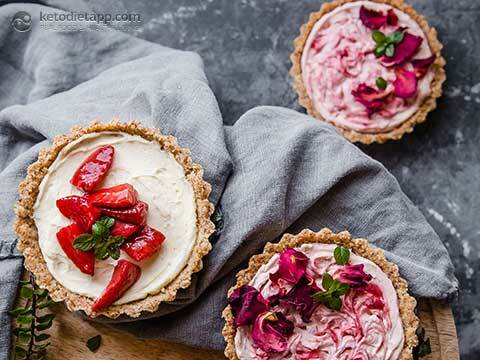 Use a toothpick or skewer to swirl the berry puree on top of the tarts. Chill for 1 hour until set. Serve with roasted berries on top. Store, covered in the fridge for up to four days. Please note that the crust will soften.